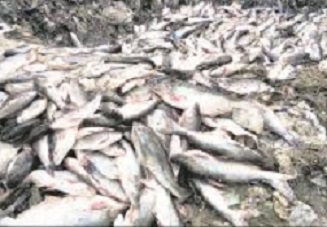 The Kohima Municipal Council (KMC) seized formalin-laced fishes imported from Andhra Pradesh weighing more than 5,280 kg on Monday and dumped them at the municipal dumping ground, stated an official. The said step is in consequent to the Nagaland Government’s ban on sale of fish for a period of three months or till corrective measures is taken. The Nagaland Post had published a report few days back highlighting how formalin used in food substances can cause serious health ailments even if one consumes it in very small quantity. Following the publication of the report, the State Government took the said step. Once the report was published, the Food Safety Commissioner, Himato Zhimomi, last week prohibited storage, distribution and sale of fresh fish products, including Crustaceans, treated with formalin or any other preservatives for three months. Not just the Kohima Municipal Council, but the Dimapur Municipal Council authorities also swung into action and collected samples to be tested on fishes to ascertain whether formalin was present. The report further stated that in Kohima, huge quantities of fish seized from four mini-trucks near the KMC toll gate was tested at the site and high levels of formalin were found. As per the World Health Medicine, formalin is actually a preservative used for dead bodies but, of late, it is being misused as a food preservative and can be lethal even if one consumes in small quantity. Formalin is actually a name of a chemical substance consisting of a mixture of formaldehyde, methanol and water. If one eats food preserved with formalin frequently, it can cause vomiting, diarrhoea and later on it can also prove to be fatal. But, this is hardly the case, because large doses of formalin are required for the same to become lethal. Formalin-laced food items can also damage the kidneys or cause cancer.